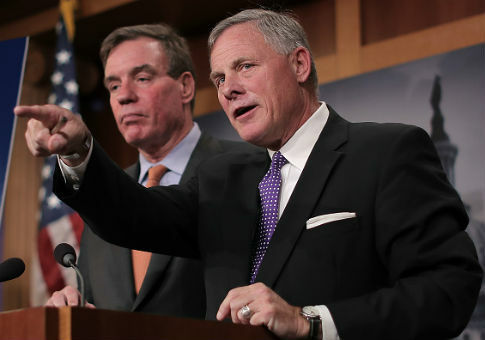 Senate Intelligence Committee Chairman Richard Burr (R., N.C.) said Wednesday he would not try to pursue avenues to obtain notes—to the extent any exist—from meetings between President Trump and Russian president Vladimir Putin. The remarks from Burr come on the heels of a weekend report by the Washington Post which said that Trump had taken pains to conceal details of his conversations with the Russian president, including taking possession of the notes of the conversations made by his own interpreter. "Trump did so after a meeting with Putin in 2017 in Hamburg that was also attended by then-Secretary of State Rex Tillerson," the Post report said. "U.S. officials learned of Trump's actions when a White House adviser and a senior State Department official sought information from the interpreter beyond a readout shared by Tillerson." CNN's Manu Raju first reported Chairman Burr's remarks. "If I were the president, I would try to claim executive privilege in anything that had to do with him," Burr was reported saying to Raju. The Post story came shortly after a New York Times report saying the FBI had opened a counterintelligence investigation into the president after he fired James Comey as FBI director in the spring of 2017. That counterintelligence investigation was meant to determine if Trump had, even unwittingly, acted as a foreign agent on behalf of Russia. The pairing of the reports gave new ammunition to Democrats on the Hill. "Congressional Democrats on Sunday pledged heightened scrutiny of President Trump's dealings with Russia, spurred on by news reports of extraordinary secrecy surrounding his conversations with Russian President Vladimir Putin and the opening in 2017 of an FBI counterintelligence probe into whether Trump worked on behalf of the Kremlin," the L.A. Times reported. On the Monday following the pair of weekend reports, Trump told reporters on the South Lawn of the White House, "I never worked for Russia," and said questions on the matter were a "disgrace."